Hakomi is a unique method of psychotherapy which assists people in exploring their deeper, often hidden, selves. It is a powerful process of personal transformation based on a trust in every individual’s inner wisdom and power for self healing. body reading, and hands-on practice. This workshop is designed to be supportive to practitioners’ own inner growth as we can only help clients to the extent we have done our own work. 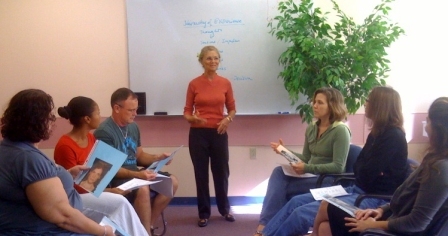 The beauty of this experiential training is that you will be engaging in your own personal therapy work. In the hands-on practice, half the time you are the therapist and half the time you are the client. To receive an article on Hakomi and how it differs from other modalities, please email Nina at nina@ninacherry.com. A practitioner who is a loving presence allows patients and clients to heal more easily in both body and mind. To become a healing presence, we must transform ourselves, becoming more aware, serene, heartful, and spacious. From this mindful and nourished place, a practitioner can see deeply into the being of the patient. . . the fears, needs, habitual behaviors, patterns, self-limiting beliefs. . . as well as the path to emotional healing. Practitioners, like everyone else, have lost much of their seeing abilities through societal and parental conditioning. In this workshop we will learn to see consciously by practicing body reading exercises, and by becoming more aware of verbal and non-verbal indicators of patients’ core material which emerges for healing.